The GNLU Legal Services Committee has been set up in the year 2007 by way of Section 4(k) of the Legal Service Authorities Act, 1987 which reads as "Develop, in consultation with the Bar Council of India, programs for clinical legal education and promote guidance and supervise the establishment and working of legal services clinics in universities, law colleges and other institutions". The Legal Aid Cell (or committee, as is the practice now), established under statutory law provides assistance through a variety of methods, including traditional casework, summary advice, self-help, community legal education, community development and policy reform initiatives. In its very initial years, the committee adopted Chharanagar, a village near Ahmedabad. The members used to frequently visit this village, providing legal assistance to the villagers and also conducting street plays on different issues like police atrocities, domestic violence etc. to raise awareness amongst the people. The LSC team successfully organized a National Conference on Contemporary Corporate Legal Issues in September, 2008. This was the LSC's First National Event and it proved to be a milestone as it witnessed the launch of "The GNLU Law Review" by Hon'ble Justice Radhakrishnan, the then Hon'ble Chief Justice of the High Court of Gujarat. In the same year, the LSC organised and conducted "Vimarsh-2008"- An Inter College Panel Discussion on Contemporary Women Issues in the university. People from different walks of life such as lawyers, journalists, academicians and social activists participated in the discussion. In July 2009, based on the directions of the Hon'ble Supreme Court of India to all Universities, an Anti-Ragging Committee was set up at the University for preventing and handling ragging related complaints. This body was established on a short notice and the Legal Services Committee members became de-facto members of the Anti-Ragging Committee. The members of the committee ensured that no instances of ragging took place in the hostel and worked to provide a friendly environment to the first years. LSC worked for a month approximately till a permanent Anti-Ragging Committee was established at the University. The Legal Services Committee organised a "Fresher's Convenience Camp" within the hostel premises to help the new entrants. The camp involved setting up of stalls which provided products and services to the students, ranging from mattresses and laptops to ATM cards and local SIM cards. This venture was found to be very useful by the first year students and the LSC received words of appreciation from the many parents who had accompanied their respective wards for the orientation. The LSC continued organising this camp till 2010. Right to Education Center: In 2013, Right to Education resource center was setup in collaboration with IIM-Ahmedabad for the analysis of the implementation of Right to Education Act, 2005. Surveys were conducted in various primary schools in Gandhinagar District to assess the level of Education and implementation of the provisions of the Act. Women Trafficking Model: In the same year, a model on Women trafficking in Gujarat was presented in the "2nd National Conference on Access to Justice" held at the West Bengal National University of Juridical Sciences, Kolkata (WBNUJS). Prohibition of Manual Scavenging Bill, Gujarat: The Committee addressed the inhuman practice of manual scavenging through a workshop, following which the committee drafted a state legislation and submitted the draft to Government of Gujarat on the present scenario of Manual Scavenging in Gujarat. Free Legal Aid Clinic: Legal Service Committee, in 2014 adopted four villages of Gandhinagar District, viz. Raysan, Kudasan, Koba and Shahpur and established free Legal Aid Clinics. Twice a week, student member visited these villages and addressed legal grievances of the people. There was an overwhelming response from the villagers, turned up seeking legal assistance on various matter related to land dispute, domestic violence and other issues. This activity has become a flagship and is currently continued in Koba, Raysan and Valad. Blood Donation Camp: The annual Blood Donation camp was held on 15th September in collaboration with the Indian Red Cross Society. Kashmir Relief Fund: The LSC in the first of its kind initiatives, organized on September 15, 2014, the Kashmir Relief Fund Campaign for the flood victims of Kashmir which saw a good response from student as well as staff. The fund raised by this initiative was around 36,000. 1st National GNLU Interlinking Legal Services Committee Annual Forum: In 2015, LSC organized the 1st National GNLU Interlinking Legal Services Committee Annual Forum. The aim of the forum was essentially to interlink all LSCs and Legal Aid Clinics of various National Law Universities across the country. The forum deliberated upon different socio-legal issues such as RTE, child rights and law, women rights and law, CSR, LGBT rights and drug abuse and collaborated with various organizations working on these issues. Activities undertaken by such collaborations include making of Accessible India Campaign Report with BPA, starting of KALAM library in Koba village for underprivileged children, launching Ahmedabad chapter of Global Women's Rights Movement- One Billion Rising Campaign, organizing Vanchan saptah in Koba and conducting of YUVA Leadership Activity which saw a participation of over hundred primary school children. Theatre wing of LSC 'Abhivyakti': The Committee has a theatre wing named Abhivyakti who perform street plays to create awareness among people about different socio-legal issues. 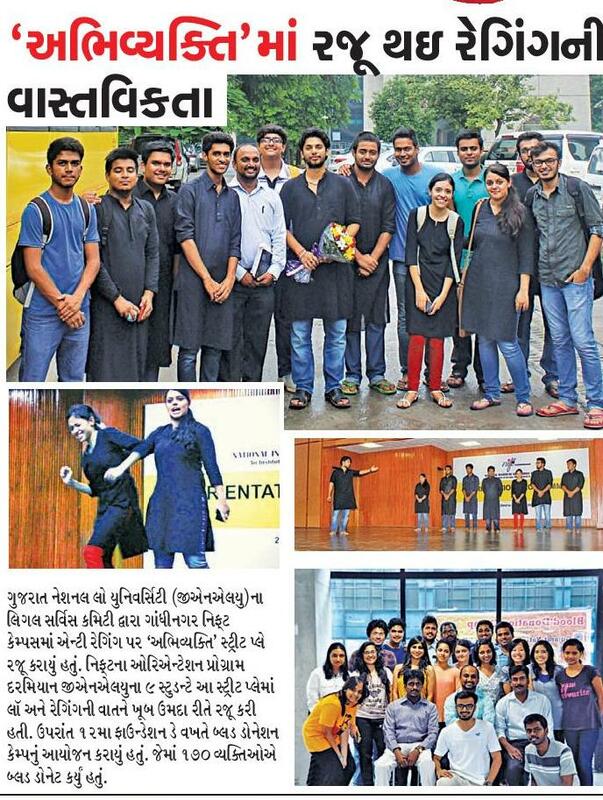 Street play in NIFT Gandhinagar The theatre wing of LSC 'Abhivyakti' performed a street play on anti-ragging to promote anti-raging environment at National Institute Fashion Technology-Gandhinagar for the orientation of fresher batch of the university. Play on Sexual Harassment at workplace Abhivyakti performed a play on the impact of Sexual Harassment at Workplace during the eve of 1st GNLU National Interlinking Annual Forum, October 03 2015. Legal Awareness Camp in Bihar: To further its objective and to reach out to the people irrespective of geographical limitation LSC organized a "Free Legal Awareness Drive" in the rural districts of Bihar. The drive received an awesome response and a continuing effort in the same direction is being done. 2nd National GNLU Interlinking Legal Service Committee Annual Forum: The Second LSC National Interlinking Forum was conducted from 8 April 2017 to 9 April 2017. The Second edition saw an enthusiastic participation of students from different law schools. The forum was a part of an initiative to provide free and competent legal services across India, and bridge any gaps that might come in between achieving the aforementioned objectives, be it due geographical and technical hindrances or inadequate finances. At the forum, emphasis was laid on issues within the state of Gujarat. The themes discussed in the forum were related to rural sanitation: cleanliness in godliness based upon the government launched Swacch Bharat Abhiyaan on 2 October 2014, disability and mental health, juvenile justice in order to take positive steps for social integration, increasing police sensitivity towards juveniles, establishing and maintaining juvenile homes, and rights of prisoners. Activity with the District Development Office (DDO), Ahmedabad: LSC worked with the District Development Office (DDO), Ahmedabad for formulation of draft schemes undertaken by the District Panchayat from August 20 to September 04 2016 and also design the web portal for the effective implementation of the RTE Act. LSC and SEWA's visit to Dehgam, Gandhinagar: Students of LSC, along with SEWA, visited Dehgam and organized a legal aid clinic registering grievances of women and providing them with free legal advice. The major aim of the visit to organize the worker to achieve their goal of full employment and provide guidance and help to setup self - help groups among themselves. LSC's Legal Awareness Camp with NCW: LSC with National Commission for Women organized two legal awareness programs dealing with rights of women, with the second program focusing on rights of working women at Pahlaj and Ahmedabad respectively. Through these workshops, women participants were not only made aware about their rights but they were also given legal advice, by the resource persons, free of cost. Kalam Library: The Committee started a Kalam Liabrary in the village of Koba for under privileged children. The library was supported by the Kalam Initiative and the Gram Panchayat, Koba Village. The library and donation of books are taken care by the LSC. Make a Difference (MAD), Ahmedabad Recruitment Orientation: Make a Difference is a youth driven, non-profit organisation working to ensure equitable outcomes for children in orphanages and street shelters by helping them in their academics and personal development, by taking regular classes. MAD conducted an orientation for the GNLU students to encourage them to participate in their recruitment drive, to be held later in the semester. YUVA Leadership Activity: The LSC in collaboration with YUVA Unstoppable - Ahmedabad Chapter, undertook the Leadership Activity. The initiative involves teaching of general studies and subjects (pertaining to curriculum as set by YUVA Unstoppable which is in consonance with the curriculum approved by the Government of Gujarat). The first day of the initiative saw the participation of LSC members along with Mr. Malav Vyas from Team YUVA and over a hundred primary school children. The event was attended by the Sarpanch of Koba Village, Mr. Yogesh and the Deputy Principal of the school Ms. Kanchan. The event also saw massive support from the teachers and school administration. This is now a regular initiative of the LSC with LSC volunteers holding these every Saturday, 9:45am - 11am at Koba Primary School. Legal Awareness Programme for women: The GNLU-NCW Legal Awareness Programme for women was held in March under GNLU Centre for Law and Society. The objective was to make the participants know more about their Legal and Constitutional Right. The two day event saw a participation of more than 50 women each day from areas in and around Ahmedabad. RTI Workshop: LSC is also working on RTI workshops for college students across Gandhinagar and Ahmedabad. It organized a special lecture on the "Right to Information Act, 2005" for the journalism students of St Xavier's College, Ahmedabad on 20th September 2017. Visit to Akshay Patra Foundation: In addition to this, LSC members from first year visited Akshay Patra Foundation based in Ahmedabad and gained knowledge about how the mid-day meal kitchen works with its giant machinery and hardworking staffs on 2th October, 2017. Blood Donation and Health Check-up Camp: The Legal Services Committee has a noble tradition of organizing blood donation camps in collaboration with the Indian Red Cross Society-Ahmedabad Chapter, every year in the GNLU campus. Following the tradition, this year also LSC organized the Blood Donation Camp along with Health Check-up on 4th October, 2017. Know your Rights Program: This program was organized to aware the student about their fundamental and legal right in Government School, Valad. Collaboration with Himmat NGO: LSC also aims to collaborate with Himmat, a charitable organization running Legal Aid Clinic in Vatva which deals with Labour laws, rights of women and domestic violence cases, to run a legal Aid Clinic in Vatva. 3rd National GNLU Interlinking Legal Services Committee Annual Forum: The LSC plans to go pan Asia with its 3rd National GNLU Interlinking Legal Services Committee Annual Forum by bringing LSCs across SAARC nations on a common platform on 12th & 13th April, 2018. Gandhinagar - 382426 (Gujarat), INDIA.